Sometimes I wish I’d lost a leg or something. Everyone can understand that. They never get it when what’s been broken is inside your head. Five years after an unspeakable tragedy that changed him forever, Gordie Allen has made a new home with his half-brother Kevin. Their arrangement works since Kevin is the only person who can protect Gordie at school and keep him focused on getting his life back on track. 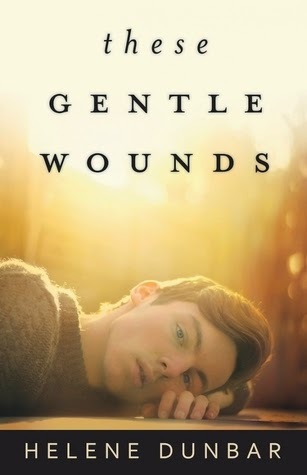 But just when it seems like things are becoming normal, Gordie’s biological father comes back into the picture, demanding a place in his life. Now there’s nothing to stop Gordie from falling into a tailspin that could cost him everything—including his relationship with Sarah, the first girl he’s trusted with the truth. With his world spinning out of control, the only one who can help Gordie is himself... if he can find the strength to confront the past and take back his future. Helene Dunbar's debut novel deals with a pretty important subject. Gordie has suffered from PTSD ever since the day when he was ten and his mum tried to kill her kids, including Gordie, by driving them in her car with her into the river. Gordie's father was abusive, and something had happened the night before that drove Gordie's mother to want to kill her children. Gordie survived, but the rest of them did not. Kevin, Gordie's half-brother, hadn't been in the car, because they don't share the same father. So after the 'incident', Gordie goes and lives with Kevin and Kevin's father, Jim. I was really glad to see a novel about a teen who suffers from PTSD; it spreads awareness and shakes the misconception that PTSD is something only soldiers suffer from, and I hope that some teens who are suffering from PTSD can find this a helpful read. But unfortunately I didn't love this book as much as I hoped I would. The story kicks off when Gordie is fifteen. Two important things happen at the start of the novel: he meets Sarah properly for the first time, and his biological father comes back, after having been away from town for the past five years. Gordie plays ice hockey for the school team, and Sarah is a photographer whom he'd seen before taking photos at the games, but they'd never really spoken until now. And once they do start speaking, Gordie feels an instant connection. A desire to know more about her. I felt like I was missing something when it came to Gordie and Sarah. I get that their romance takes a backseat to Gordie's intensely personal journey in this book and all the stuff that he has to go through, and I appreciated that the romance doesn't take over the book when there are more important things that Gordie needs to deal with, but still... Gordie and Sarah have barely even had a real conversation before suddenly Gordie's thinking about how much he likes her and how he's really into her. That had me so confused. I kept thinking, did I accidentally flip past a scene between the two of them? Because they've only talked maybe twice and neither of those conversations were particularly long or inspiring. Then they finally had a longer scene together where they go camping, and it was cute and a bit awkward and really enjoyable to read, and I was starting to see why they liked each other. And eventually you get a couple more glimpses of how awesome Sarah is, but ultimately there isn't really another scene between Gordie and Sarah that comes even close to the length and depth of the camping scene, and I never really felt like I got to know her at all. There's this bit when she invites Gordie to a concert (she plays the flute – not classical flute, but rock flute! ), and Gordie wants to go. He listens to some recordings to her music and he thinks about how cool it might be to see her play in person, but then he never ends up going to the concert because other stuff comes up. And I was really disappointed that there was never another opportunity in the story for him to watch her play, and the whole thing's never really brought up again. It's basically never mentioned again in the story that she plays the flute. I felt like the development of their romance just seemed to happen more in Gordie's head than actually in scenes between the two of them, which are woefully few and far between. Sarah felt kind of absent from the story for the most part. Everything in this story just seems kind of fragmentary and under-developed, like the romance. I don't know, it's hard to explain, but I just never felt like I got the full picture. I never fully connected with or understood anyone in the story. All the relationships came to me in glimpses, but I had barely any idea what any of the other characters were like outside of their relationships to Gordie. Still, I appreciated the support that Gordie has from the other characters: from Kevin, from Jim, from Sarah, from Mr. Brooks, the only teacher who seems to understand Gordie and who has always been there for Gordie to talk to, and from Ms. DeSilva, the lawyer who had dealt with everything five years ago and is dealing with everything now, who is incredibly helpful and sympathetic. I liked the relationship between Kevin and Gordie, how complicated it was and how it got rocky at times, how Kevin had difficult problems of his own to deal with and can sometimes be quite prickly and even, in one scene, a little cruel, but in the end you can tell that he'll always be there for Gordie. There was definitely a lot of focus on Gordie's PTSD, and I think it was a sufficiently detailed portrayal that never shied away from the reality of Gordie's 'spins' (his flashbacks to That Day, or to other memories from his childhood before That Day). It never tried to simplify things or make things seem easy. It tackled the subject head on. It was consistent and constant, not something that faded in and out of the book, and you could tell that this was something that affected Gordie every moment of his life. I think Dunbar did a great job with this. But in the end, for a book that's concerned with such heavy subject matter, I just didn't feel very deeply impacted by it. I feel like the whole story just sort of blew past me in a gentle breeze. I was never very moved by Gordie's story, but I felt kind of detached from it all. I feel frustrated, because it's really not a badly-written story by any means. Maybe you'll have better luck connecting with Gordie than I did though. Aww it's too bad that this one wasn't better for you. I actually have PTSD and the only YA book I've read that dealt with that topic was Laurie Halse Anderson's The Impossible Knife of Memory. It's cool to find out that there's another one! And this time it's actually the MC, not a parent, which is even better. AND it's not associated with soldiers. I think you're right, that that's a pretty big & common misconception about PTSD. I'm definitely still going to add it to my TBR shelf...maybe it'll resonate more with me, as somebody who's personally gone through it? I feel like sometimes that happens — people end up liking certain books more depending on how much the MC reminds them of themselves. But sometimes it's the complete opposite! Haha. Thanks! I read Crazy by Amy Reed last night and really really loved it! Am struggling to write a review that will do it justice. btw, can't wait to read your review for Crazy. I know, but all the other reviews on Goodreads seemed to love this book and I see loads of readers who were moved by it, so. Maybe you'll like it? I think I may read Boy21 at some point, though I don't know if I can fit it in for this month... Hmm. I just posted my review for Crazy! I loved that book so much, omg.